Rebels in eastern Democratic Republic of Congo killed three Indian peacekeepers in an apparent ambush. Dozens of machete-wielding men dressed in raffia palms attacked as soldiers opened a fortified base to help a group of civilians, the Indian army said. The attackers are thought to belong to the Mai Mai militia group, blamed for contributing to the violence that has disrupted the region for years. The motive for the night attack is unclear, the Indian army said. A group of five Congolese civilians came to the base, operated by the UN's peacekeeper mission, known as Monusco, in the town of Kirumba. "They asked the post for assistance. While they were engaging the guard in conversation, a group of approximately 50 rebels attacked the post from the surrounding jungle," an Indian army statement said. The soldiers opened fire and drove the rebels away, but not before three Indian soldiers were killed and seven wounded, it added. 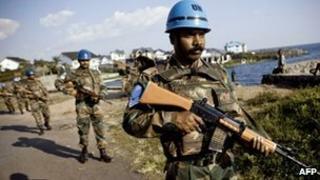 Nearly 4,000 Indian army soldiers are part of the UN Congo peacekeeping mission. Repeated rebel attacks in Congo have called into question the ability of the UN force to protect civilians.